Bright light coverage eliminates shadows, emulating daylight. After extensive testing, Awaken’s entire Qx8Ho range has been calculated, according to Dept. Of Energy guidelines, to last 414,000 hours, at which point 70% of the initial light output will still remain. You’ll never have to change a light bulb or ballast again, because there are none. Dark Sky compliant to eliminate light straying into the dark sky at night. The fixture can be tilted 15° to adjust the light distribution pattern. The Qx8Ho’s unique low voltage LED modules provide easy on-site service. Each module unplugs and removes quickly and easily. Upgrading is easy - by simply swapping the module. The Color Rendering Index (CRI) states how ‘true’ colors appear. Typically, HPS is 65 and Metal Halide is 70. The LED Qx8Ho is 75. Awaken’s color, brightness and CRI enhances nighttime safety. Injection molded UV polycarbonate lens provides even light uniformity, without sideways glare. Maximizes pole spacing and eliminates dark zones. Type I through Type V light distribution available. No glare or heavy weight. Meets light cut-off requirements to protect neighbors and passing motorists from distracting light. 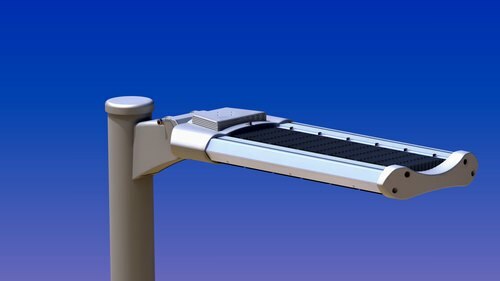 Lightweight design protects the light pole during very windy weather conditions. Each LED module contains 24 LEDs. Integrated extruded aluminum heat sink. Multi-slot heat sink design keeps LEDs cool for reliable operation and long life. Spacing between module allows flushing of debris. Failsafe design reacts to LED failure by boosting lumen levels of the other LEDs in order to compensate. LED module are field replaceable with quick-connect waterproof cable connector. Each component can easily be repaired or replaced in the field. LED modules can be replaced without having to disconnect power. Modern evolutionary design of the traditional shoe box provides curb appeal. Multi slot heat sink design for maximum heat dissipation. Polycarbonate UV lenses are field replaceable, with Type 1 - Type 5 distributions. Failsafe designs ensures the LEDs within a module will brighten up to compensate for any failed LED. Spacing between LED modules allows debris to easily flush through. Choose direct or tenon mounting with easy adjustment up to 15° tilt. 20kV surge suppressor handles most common power surges and spikes. Integrated, multi-cell, multi-tier Fresnel lens provides a 270 degree field of view for PIR detection. Built in photocell receptacle, as well as 0-10v, 7 stage dimming. LED drivers are housed in easily accessible separate compartment. Low weight, low EPA for minimum stress on the light pole. Adjustable photocell thresholds, time of day scheduling and an astronomical clock with up to 9 time-of-day actions for additional savings; all controlled from any PC.